2 » Former Gators dazzler and ESPN sideline reporter Erin Andrews finished third in her quest to win ABC‘s Dancing with the Stars competition. Andrews got further than many expected on the program and is rumored to have begun a relationship with her dance partner on the show. She is currently in the process of finalizing a new contract (including a significant raise) with the Worldwide Leader in Sports and hopes to expand her horizons beyond college sports and baseball. 3 » Two Florida softball players – juniors pitcher Stephanie Brombacher and outfielder Kelsey Bruder – have been named 2010 ESPN The Magazine Academic All-Americans by the College of Sports Information Directors of America (CoSIDA). Named to the third- and second-teams, respectively, each earned at least a 3.30 GPA. 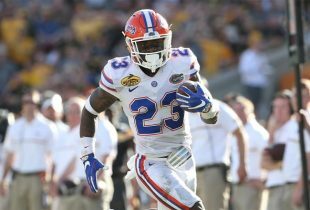 4 » Former Gators inside linebackers Channing Crowder and Andra Davis were both in the news Wednesday. A report from the Sun-Sentinel states that Crowder may begin the season on the Miami Dolphins’ physically unable to perform list if his foot does not heal properly, while another from the Buffalo News infers that Davis is set to start for the Buffalo Bills alongside Paul Posluszny.